5793 labyrinths found. Showing 5641-5660. Sorted by country, state, city, then zip/postal code. 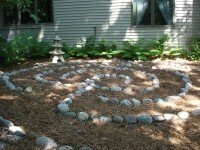 Our labyrinth is located to the left of the library parking lot, just beyond the entrance doors. The Phoenix Park labyrinth is downtown - close to the river and the railroad bridge. During the summer it is the staging area for Thursday evening free concerts. It is also used for weddings & other ceremonial gatherings, besides the normal individual or group walking. Seven-circuit classical, based on a spiral. Hwy 57 North from Sturgeon Bay. In Jacksonport make a Left on to County road V, then make a right on to County road A. Take the first left on to Junction Road and it is the second driveway on the left. Follow path signs to the Labyrinth. 45 00' 10.04" N° Lat. ; 87 11' 42.74" W° Long. Just off Hwy 42 at corner of Deer Trail near the tip of Wisconsin's Door County Peninsula. "Trinity Labyrinth", loosely based on Chartres labyrinth, containing three distinct areas as opposed to the four that exist in Chartres. Located in Seminary Park, one block south of Main Street on Fourth Street. A sitting wall should be complete by mid July, 2016, final landscaping fall of 2016. Labyrinth is now open. Generally anytime. Please do not park in the next door apartment lot. After first snowfall of the season. 3 miles south of Evansville WI off of Hwy 59. Turn south on Michael Drive and head left up into the small rural subdivision. Park in the driveway turn around or on the street. 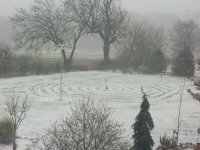 The spiral labyrinth is in the south east back area of the yard. 54 feet in diamteter. 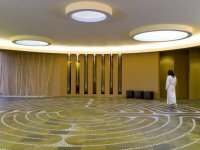 This is a spiral labyrinth with an opening to the west. There are 9 circuits including the outer circumference. Near the Emergency Room entrance. Also has a rock and waterfall wall and a reclining chair that plays music "through" the chair. There are 2 meditation gardens outside. Sometimes there are chairs or a lecturn on the labyrinth making it difficult to get around. Kinstone Labyrinth with the Kinstone Circle (an 81' stone circle) on the ridge above. Located 3 blocks off Hwy 43, go east on Silver Spring Drive, we are located on the corner of Silver Spring and Navajo on the South side of the street. Located in the field near the camp offices. 7 circuit, 47 feet in diam. 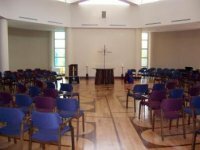 As part of Evensong Spa, the facility is usually open daily from at least 9 a.m. to 5 p.m. Onto Carmichael Road, go left onto Stageline Road. Please call or email for directions and availability.